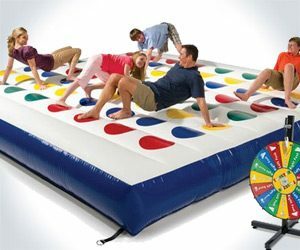 Inflatable Twister is a must have game for any event. Twister is a lot of fun to play, however, when you were growing up did you not wish you had a much larger game board that could fit all of your friends? Also did you not want a game board that did not get messed up when you tried to stand on it. What about a spinner that did not fall apart when you were playing. This inflatable solves both the problem of size and durability. at 15 by 15 you have plenty of room to bend, twist, stand, crawl, fall off of. Order this game today and get stretched out!